One of the areas that Connecting4Communities is working on is to reach out to our UIC neighbor, as they have reached out to us, to build a real residential university community through a partnership between our neighborhoods and UIC. SAVE the DATE! On SATURDAY, APRIL 20 at 7:30 pm C4C will be sponsoring a COMMUNITY UIC THEATRE NIGHT and we will enjoy The Time of Your Life, a play by William Saroyan. The play is directed by Yaseen Peyankove, a Joseph Jefferson award ensemble member of the Steppenwolf Theatre Company and Associate Professor and Director of Theatre Studies at UIC Theatre of the Performing Arts. Select April 20th performance of Time of Your Life, select general for ticket type and the quantity of tickets. Further below on the screen there will a window to enter your promotional code, enter C4C and click apply for your discount. 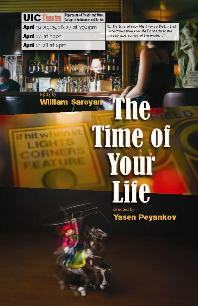 This special offer includes a post-show discussion with Yasen Peyankov and the cast of Time of Your Life. Thank you to Barbara Risman, UIC Professor and University Commons resident for putting this event together! Join us after the discussion for a drink at La Tabernas on Halsted. If you can’t join us that evening there are other performance dates. Just note that the discount does not apply.